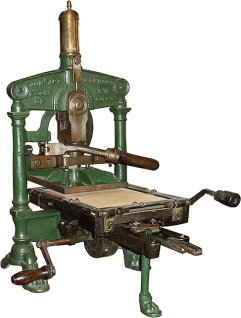 The Albion, a direct descendant of Gutenberg’s wooden press (see the Gutenberg), was an English bench-top press invented by Richard Whittaker Cope (?-1828) of London. The date of invention is not known, but the first record of the press is from 1822 when some Albions were imported into France. Presumably Cope chose the name “Albion”–a poetic name for England–in response to the Columbian Press, recently arrived from America. The Albion was advertised as being lighter and less bulky than rival English iron hand presses like the Stanhope. The Albion had ample power, particularly in the smaller sizes, and became the most popular hand press in Britain, as the Washington was to be in the United States. The Albion has a different type of toggle lever from that of American-made iron hand presses and a large spring on top of the press for the return of the platen. This arrangement was much more compact than the long levers of American presses of the time like the Wells. At the time of Richard Cope’s death around 1830, his company was taken over by John Hopkinson working under J. & J. Barrett, trustees of Cope’s estate. For ten years, all three names were cast into the press, but after 1840 the style was simply known as “Hopkinson & Cope.” Albions were manufactured in England from the 1820s until the end of the nineteenth century, but few, if any, arrived in the United States until the twentieth century when they were brought in by collectors. This particular Albion has a 9 1/2″ x 15″ “foolscap folio” platen, so named for the size of the sheet that it would print (9 3/4″ x 15″). It reads “Jon & Jer Barrett, Exors of R.W. Cope, Finsbury, London,” and is dated 1842. It is a table-top press that usually sits atop a wooden stand (not shown). The Albion/Kelmscott press, in contrast, is a floor model press.